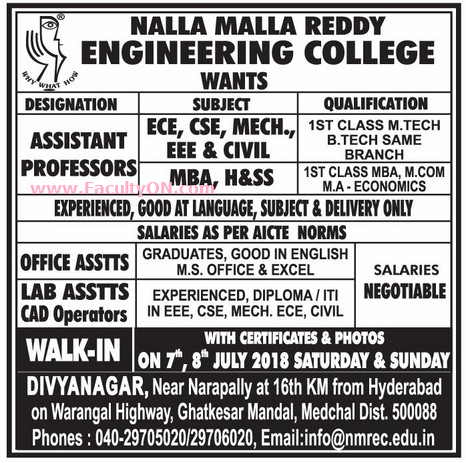 Nalla Malla Reddy Engineering College Medchal has advertised in the EENADU newspaper for the recruitment of Assistant Professor Plus Non-Faculty jobs vacancies. Interested and eligible job aspirants are requested to walk-in on 07th and 08th July 2018. Check out further more details below. About College: Nalla Malla Reddy Engineering College is giving a complete education by concentrating on all these aspects of professional building. We have been continuously in the thought process of improving the quality of students by implementing various activities like language development, insisting on student discipline, and enthusing the students by encouraging them to participate in extra curricular activities like sports apart from their academics.The college has been in the process of continuously training all the faculty to maintain high standards of classroom delivery. Efforts are also in place for improving the student skills by offering some skill oriented courses for the students. How to Apply: Interested and eligible candidates are requested to attend the Walk-in interview with updated CV along with originals / copies of certificates of education qualification / experience and recent PP size photos to the following walk-in address.